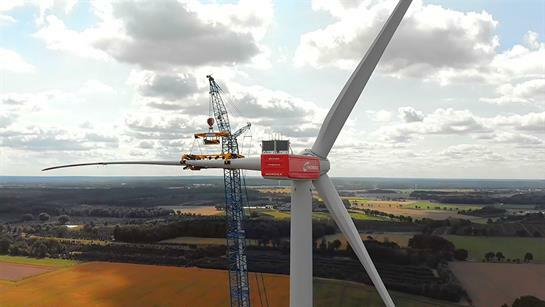 GERMANY: Nordex is leading the way on large onshore turbines with super-sized rotor diameters, following the installation in late August of the first of two N149/4.5MW prototypes. Eize de Vries watched the installation and finds out the manufacturer's plans for the Delta4000 platform. The completed 125-metre tubular steel tower loomed high above the ripe cornfields close to the A1 motorway that runs between Hamburg and Bremen when I made my visit. 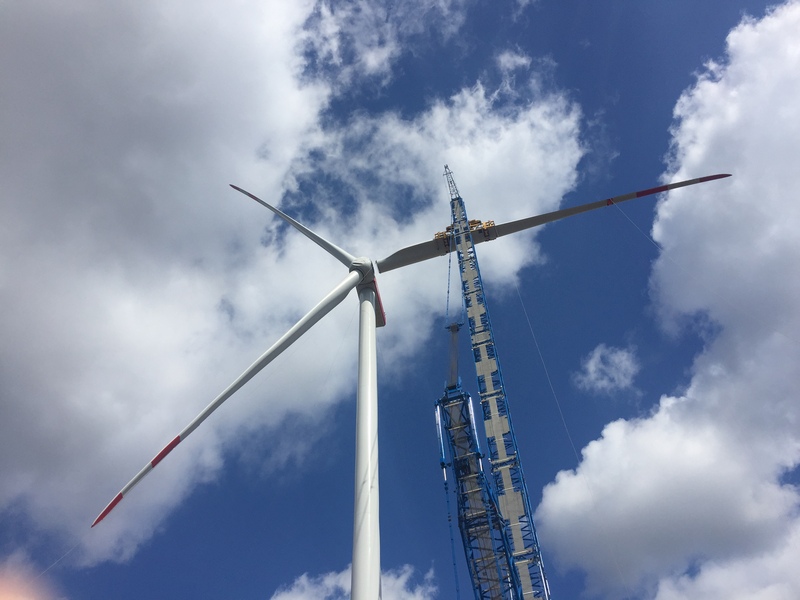 The Nordex N149 will initially be available in the German market with a 164-metre concrete-steel hybrid tower, which will be manufactured by German specialist Ventur. Two tubular steel towers, of 105 and 125 metres respectively, will also be available, with intermediate hub heights offered on a project-specific basis. The steel towers are characterised by their slender shape and narrow base diameter of around 4.3 metres. This is considered the maximum size to allow passage beneath most railway crossings and other obstacles in Europe and North America. Despite this, the tower base interior has sufficient space to accommodate the elevator and the control cabinet with the main power transport switch. 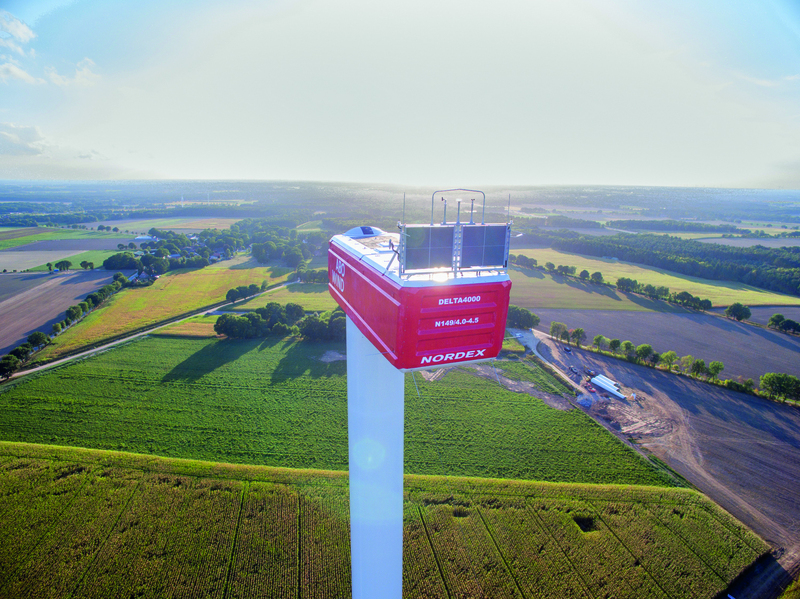 The nacelle, lying on the ground close to the tower, was painted bright red, a departure from the usual Nordex colour scheme, but a legal visibility requirement due to the site’s close proximity to Hamburg airport. Nearby were the pre-assembled drivetrain, rotor hub and two rotor blades, with the third blade approaching the site on a dolly transporter from the Nordex blade plant in Rostock. This was then offloaded at a temporary parking lot around a kilometre from the construction site, and mounted on a self-propelled multi-wheel transporter (SPMT) with blade adapter for the last stretch. The nacelle and drivetrain were installed at night on the first day of my visit. 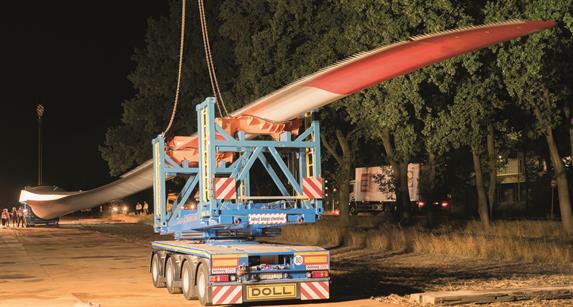 Transporting 73-metre blades over long stretches through forested areas, winding roads and bridge-crossings means confronting some major challenges, said N149 project manager Max Jungk. "As for offshore wind, we therefore use a dolly transport concept, whereby the blade itself acts a self-supporting structure, linking the truck tractor unit with the self-steering dolly trailer." SPMTs with tiltable blade adapters are deployed in parallel to cover the final stretch to complex construction sites. These remotely controllable steerable vehicles can elevate rotor blades to angles of up to 60 degrees. The last stretch was covered early in the morning of the second day. The track has overhanging trees on both sides, and a 90-degree corner about halfway. "We studied the entire track in detail prior to all separate component transports," says Jungk, standing near the sharp bend. "For the blades especially we considered various options, including using the dolly transporter for the final stretch. This would have saved costs, but it would have required cutting down some trees in and around the corner area." However, the entire SPMT blade transport went surprisingly smoothly and quickly, taking around 90 minutes despite the precision passage past tree crowns on the road, up to a temporary storage area near the turbine location. Blade mounting is an impressive process, conducted one unit at a time, which is a necessity for blades of this length, onshore and offshore. The bright-yellow coated hi-tech lifting and gripping device, co-developed with an industrial partner, is attached to a blade in its centre of gravity. It is then hoisted into a horizontal position for precision mounting to a matching pitch bearing in the hub. Being a frontrunner in the 150-metre range for onshore turbine rotor diameters comes with its own pressures, admits Till Junge, head of product strategy at Nordex. Staying close to product development timelines and meeting prototype installation deadlines is far from easy. "A strong motivation to keep up the pressure during N149 development was that new auction systems are being introduced everywhere, and these cause huge downward price pressure and much stronger competition," says Junge. 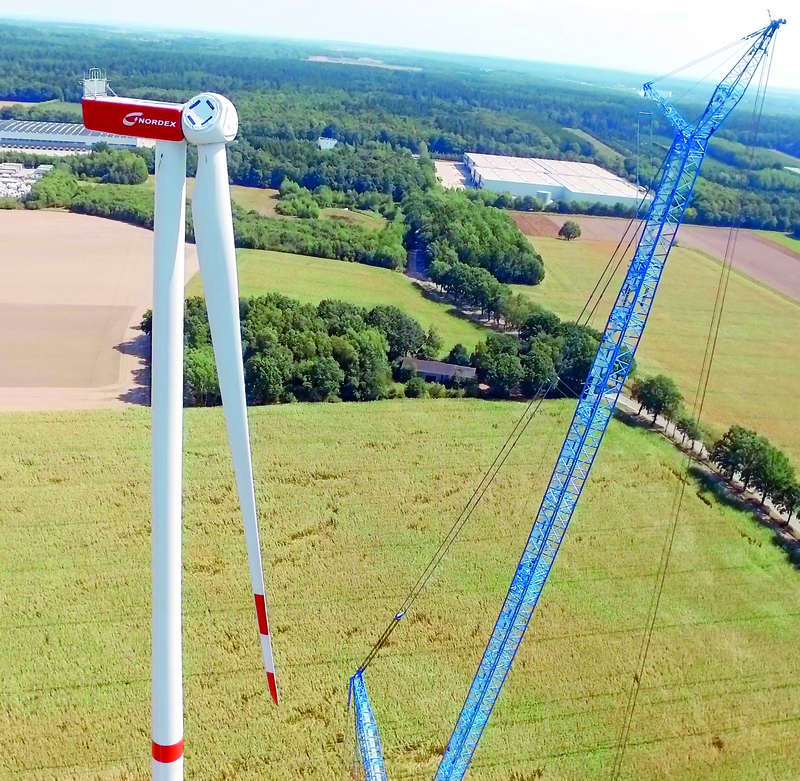 "Germany and the main export markets are not showing any hesitation in moving from state-of-the-art 2-3MW turbines into the new 4MW-plus class. The entire process is reinforced by the ongoing evolution of proven wind technology." Jungk points out that the nacelle dimensions of the Delta4000 series are the same as those of the 3MW N131 model introduced in 2013. This is despite the higher turbine loads due to the N149’s 29% increase in rotor-swept area and the increased power rating range. "Two main positive impacts are the enhancement and extended use of our existing supply chain," he says. "Because the Delta4000 series is a technological evolution of the original Delta platform, Nordex has retained the proven three-point gearbox support solution, together with the deployment of a doubly fed induction generator [DFIG] at 660V level. "A main change, compared with the Gamma and Delta series, is moving the power-electronic converter and MV-transformer from the tower base to inside the nacelle. "As well as enabling quicker installation, this technology measure curbs electric power transport loss down the tower, a benefit reinforced by higher towers and increased rating." High-speed geared drivetrain configuration preference in the onshore wind industry continues to differ between three- and four-point gearbox support (where the main shaft has two bearings), including for the latest 4MW-plus turbines entering the market. The Acciona Windpower-derived AW3000 platform has a four-point gearbox support, plus DFIG operating at 12kV level. "We continue to be happy with these specialised platform topologies," says Junge. 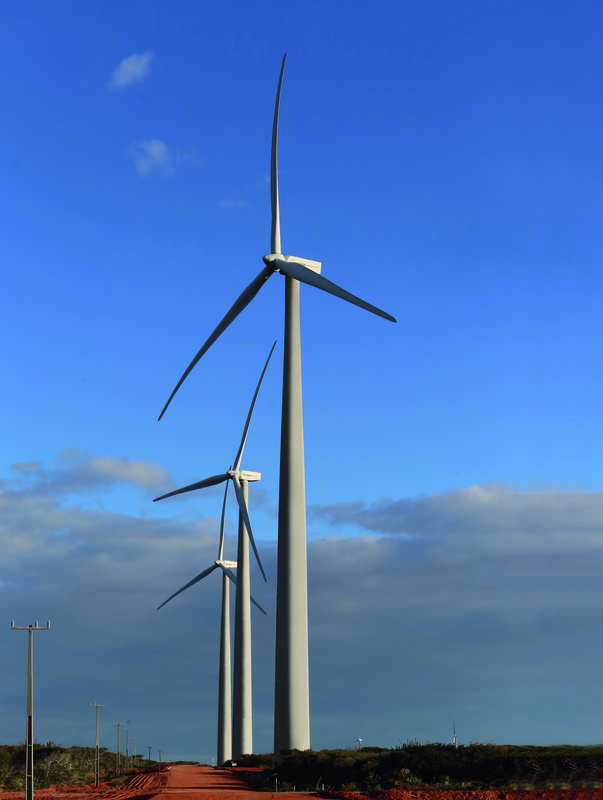 "The N149 has its strong suit in projects with strong competitive pressure on enhancing turbine scale, as well as sites with higher complexity in wind conditions, or requirements such as sound emission. While synergies might not seem directly visible in the joint-technology evolution, there are many examples where it has already happened, argues Jungk. "The joint know-how with the Nordex Group benefited the development of the Delta4000 in many areas, for example, in optimising control strategies to reduce loads effectively and thus enabling higher yield at a lower cost," he says. "The development of the NR74.5 blade received a further boost from the Nordex Blade Technology Centre ApS [formerly SSP Technology, acquired by Nordex in February 2017]. "They brought in know-how and technology on high-performance solutions for the blade’s root joint, high-capacity moulds and experience on blade production ramp-up and workforce optimisation." The first Delta4000 model announced was the N149/4.0-4.5, aimed at low-and medium-wind conditions. 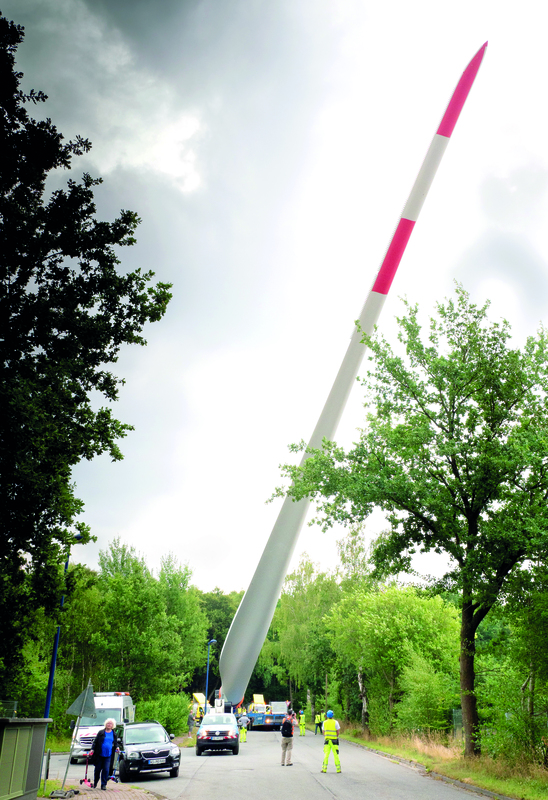 But earlier this year Nordex presented the N133/4.8 sister model, for high-wind IEC I sites. The N133 is fitted with the NR65.5 blades that were initially developed for the 3MW N131/3000 Delta. "Because we’ve reapplied the same blade, and only a few additional changes were necessary to the N149, the overall development effort was modest," says Junge. "We plan to install the prototype at the end of the year with series product starting in the first half of 2019." Asked about the future of the Delta platform, including a possible low-wind model with a rotor diameter in the 160-metre range, Junge declines to be drawn. "At this stage, I cannot comment in detail on future steps with the Delta4000 platform, but we have some very promising plans in the drawer," he says. Junge also makes the point that since the uprating of the original Delta platform to 3.6MW, Nordex has certified all turbines as IEC S class machines. The rationale for this is that enhanced data-analytics capabilities have allowed the company to design new turbines precisely to a pre-defined bandwidth of sites and their requirements based on the analysis of actual wind and site data, instead of designing the turbine to the standard IEC class wind and turbulence parameters. This approach allows the design to be more "on point" and therefore more efficient in terms of the levelised cost of energy. "This approach offers exciting new opportunities, such as various optimised operating modes that maximise annual energy production under specific site conditions, such as high wind plus low turbulence, or low wind with high turbulence," says Junge. "The flexible power ratings between 4.0 and 4.5MW for the N149 are well suited for multiple different operating environments. "It can thus operate within various former IEC II and IEC III design envelopes, which often occur even within one large wind farm. "Under certain conditions, this might allow operating in mean wind speeds of 8m/s and above, provided this loads enhancement is sufficiently compensated by loads-reducing main variables elsewhere," he says. The Nordex Group’s AW3000 product series was expanded late last year with the launch of the AW140/3000, a 3MW turbine with a 140-metre rotor diameter and a specific power rating of only 195W/m. The specific power rating of the N149, assuming a 4MW nameplate capacity, is 229W/m. The AW140/3000 has been developed for low-wind markets such as India. A prototype has been running in Spain since July, and full type certification is expected by the end of this year, to be followed by series production. The AW132 model has also recently been upgraded from 3.3MW to 3.465MW, and it is targeted at IEC IIB conditions. An option for all Nordex Group products in markets such as Mexico and Brazil is the Acciona-developed 120-metre full concrete tower.